Continuing my travel spree this year, I'm now bound for another trip just 2 weeks after I got back from Seoul - this time to a local destination in the Philippines. I just got home from this short 3-day trip and you might ask from where - no other than the "City of Smiles". 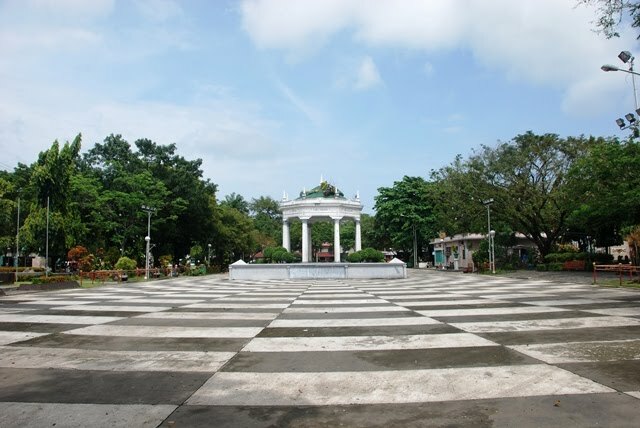 Bacolod City is the capital of Negros Occidental province and is one of the highly urbanized cities in Visayas. This is one of those "backpacking trip" I do by myself once in a while. 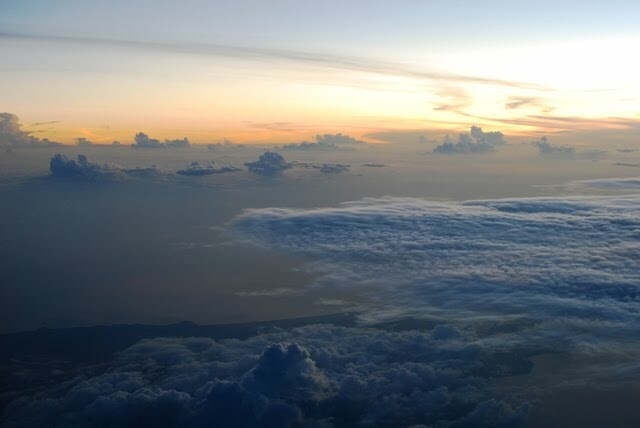 Armed with my backpack, camera and tripod, I took the 4:55AM PR 131 flight last September 19 to the city, and boy was it was so early that was half-awake most of the time! It was 6:00AM when we arrived at the airport and after disembarking, I found myself alive and kicking, eager to be in the city. 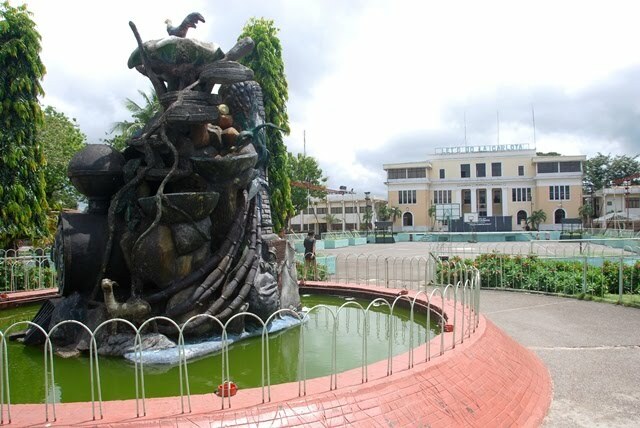 The New Bacolod-Silay Airport, is relatively a new airport, which started it's operations last January 2008. 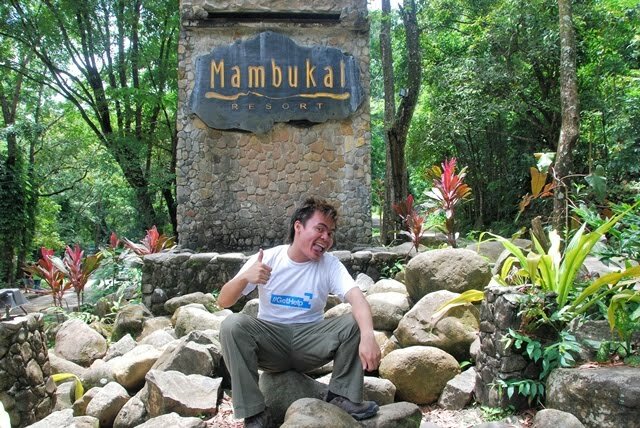 It is located a little less than 20 kilometers away from Bacolod city center so I took a shuttle (PHP100) that brought me to where I'll be staying for 2 nights in the city. 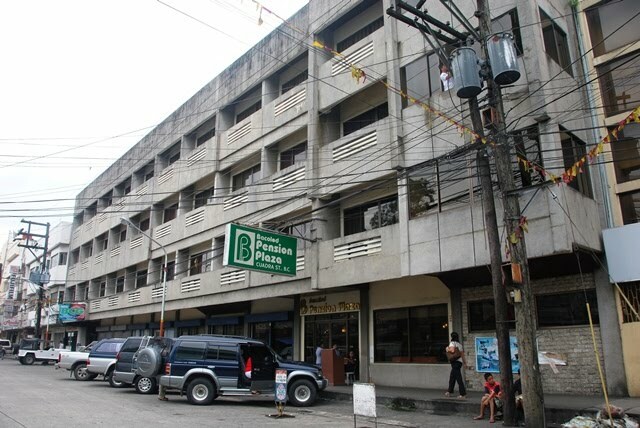 Since this is a budget travel, I stayed in Bacolod Pension Plaza and got a deluxe room. To my surprise the room has twin beds. Since I was alone for this trip, I slept in one bed on the first night and on the other the second. 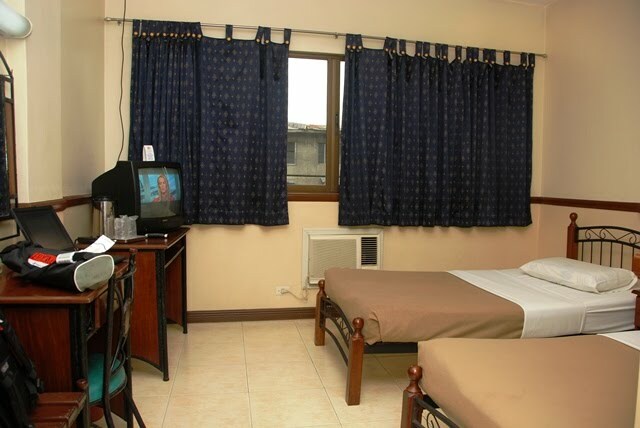 For PHP800, it was a good rate considering it has all the good amenities - cable television, airconditioning and hot shower. I stayed and rested for at least an hour, and even tried to take a nap but my excitement is killing me so I decided later on to go out and explore the city. The hotel I'm staying is very near the public plaza so a lot of things is just walking distance. I saw San Sebastian Cathedral so that's where my first stop was. 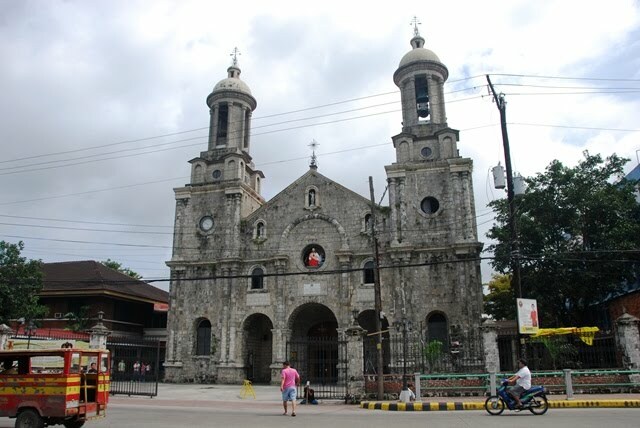 The cathedral was constructed between 1876-1875 which replaced an older wooden church. 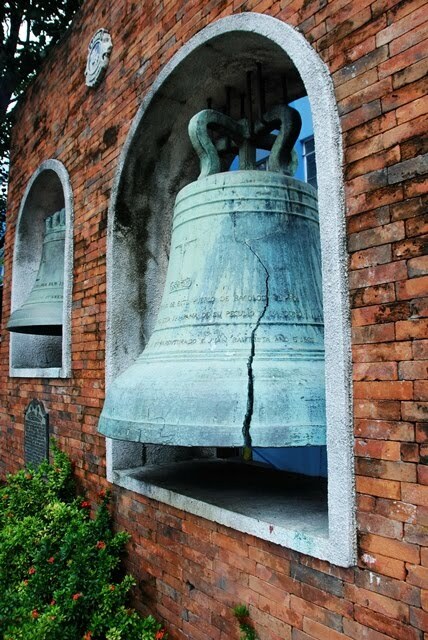 On the older church, there were donated bells that were installed during 1863, and these bells were then transferred to the new cathedral. The towers of the cathedral were however reconstructed during 1969 and the bells never got back to the top. In 1976 the towers emerged again in a special belfry built on the grounds of the church. Then my hunger called for food! It was breakfast time and I haven't had anything yet so I scouted for something to eat and saw an eatery serving "batchoy", a noodle soup dish with chicharon (pork cracklings), meat (pork and chicken) and vegatables. It was very good and satisfying! And it was only PHP17 a small bowl size! After breakfast, I explored the public plaza which is just across the church. The grounds of the concrete park was designed with checkered black and white flooring. 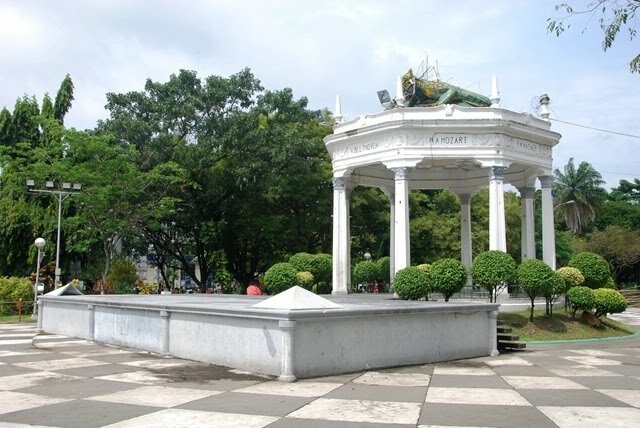 At the center of the public plaza is a gazebo where names of known classical music composers are inscribed - Wagner, Haydn, Mozart and Beethoven. Then I began to feel tired and sleepy so I headed back to the hotel and took around 2-3 hours of sleep to gather more energy for later activities. For this trip, I really didn't have much research, so majority of where I go to was based on talking with local folks and a few searches while I was there. 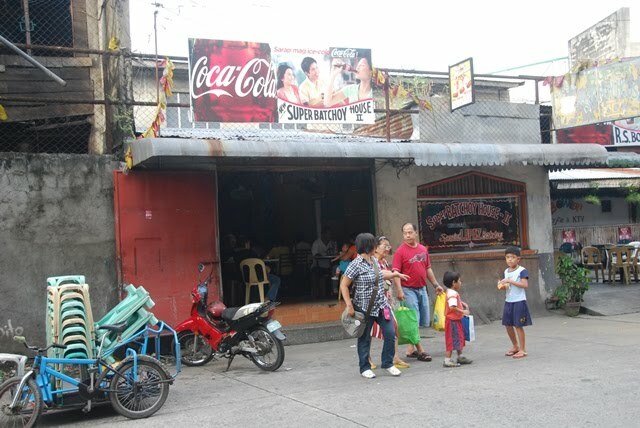 I decided to go to Silay City by riding a jeepney to Robinson's Place (PHP7), then transferred to another jeepney bound for Silay City (PHP13). 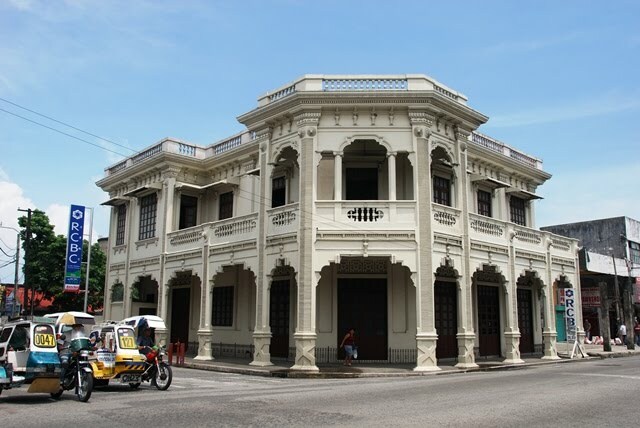 Silay City is known locally to be the "Paris of Negros" due to a number of preserved heritage houses that stands proudly today. 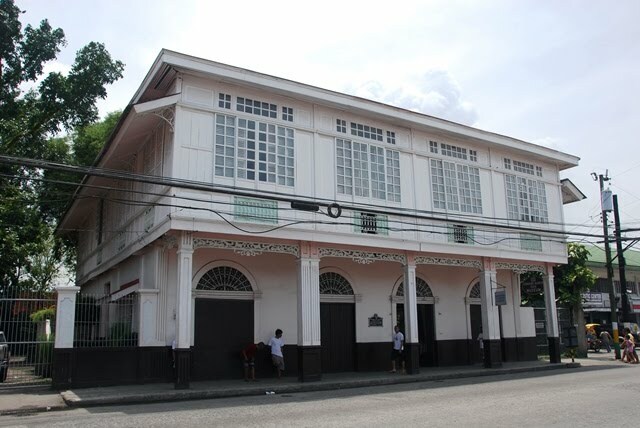 A lot of these houses are historical landmarks that the city is considered to be a museum city. 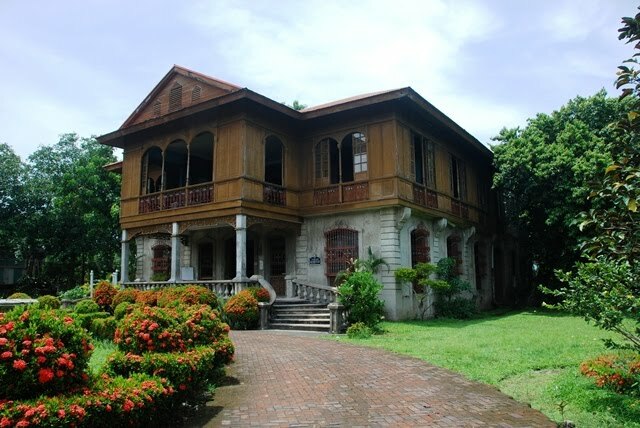 Balay Negrense was an ancestral house of Victor Fernandez Gaston built in 1897. 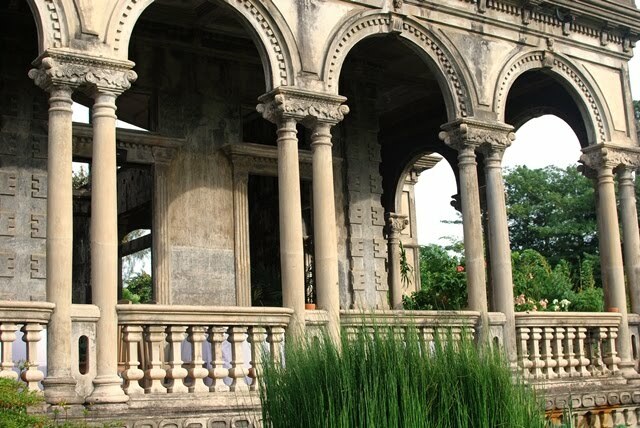 It was left in abandoned and collapsing during 1970s and was restored, turned into a museum by 1990. The museum however was closed (or no one was there to entertain me) so I wasn't able to come in and view the displays. 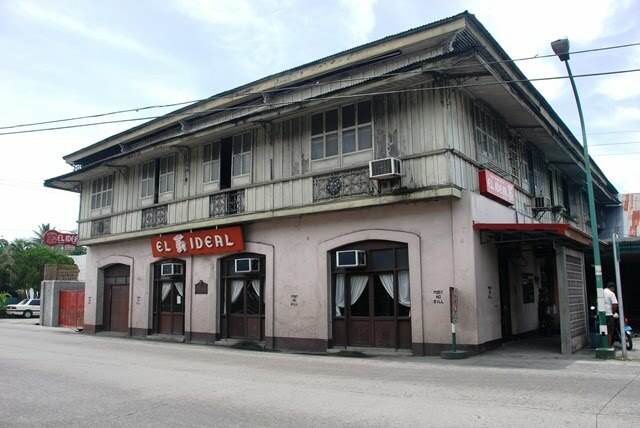 Cesar Lacson Locsin Ancestral House, where El Ideal, a bakery established in 1920's, still stands today. 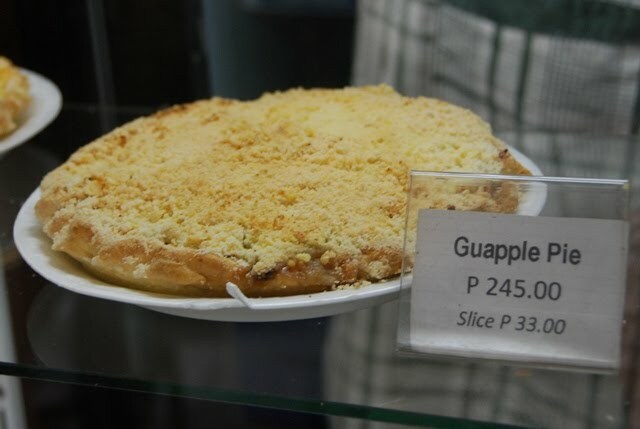 Talking to locals, I was told that this bakery is famous for it's Guapple Pie. 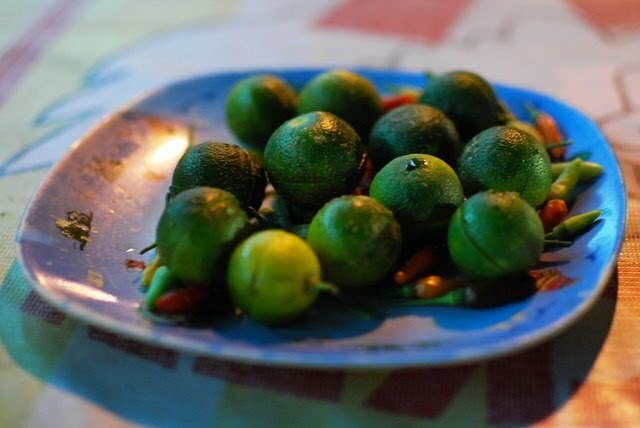 I haven't heard of guapple until then, which at first I thought to be a combination of guava and apple. But searching further, it is actually a variety of guava. 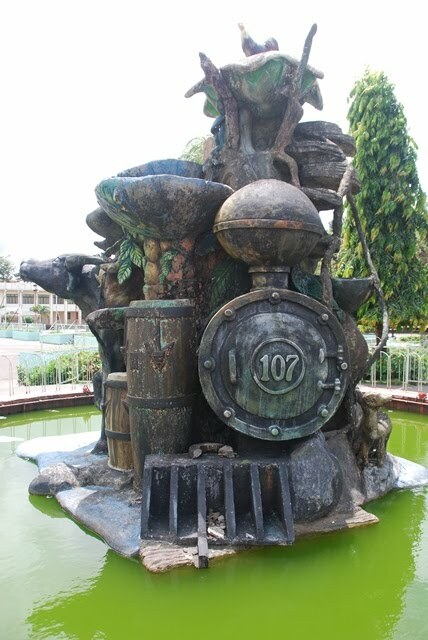 It was late in the afternoon already so I headed back to Bacolod City again to take a rest. While walking towards the hotel, I saw some sort of a commotion outside Dunkin' Donuts. 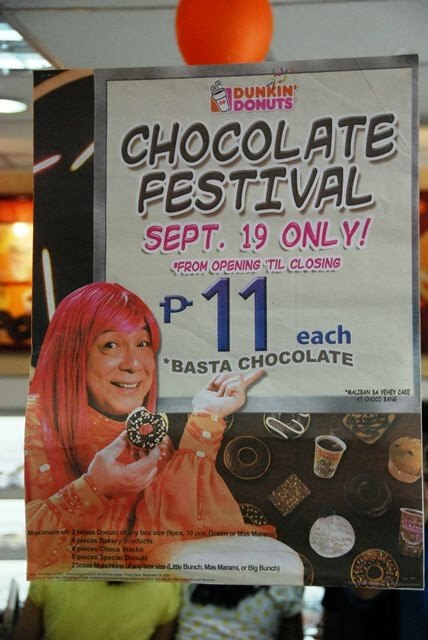 Looking closer it was their Chocolate Festival that day, where they sell everything for PHP11 each. 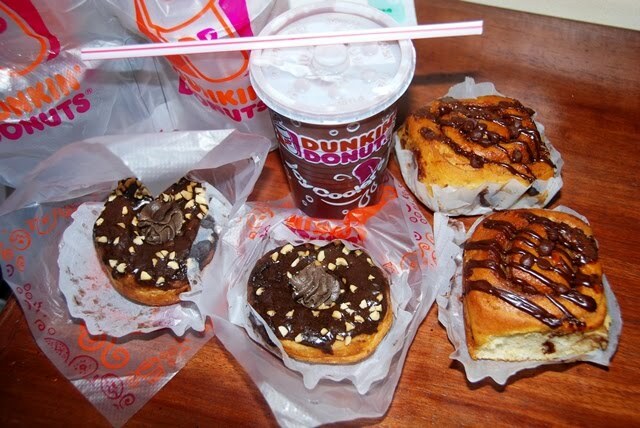 I cannot resist the temptation so I joined in, I got 4 donuts and 2 icy chocos to-go. 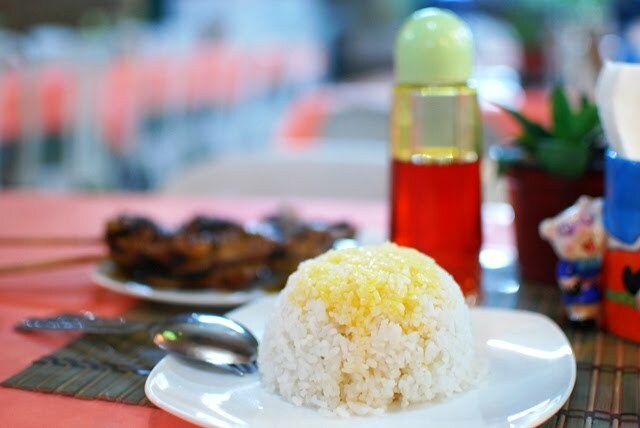 I was a very happy kid, until I grew hungry again that night so I went to Manokan Country, a place walking distance from the plaza and across SM City Bacolod where a number of stalls are selling a dish the city is known for - Bacolod chicken inasal! 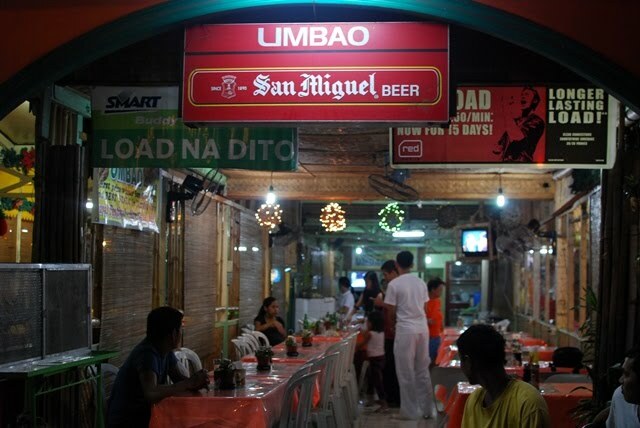 Nothing in particular, but I chose to eat in Umbao because it was clean and looks comfortable to me. 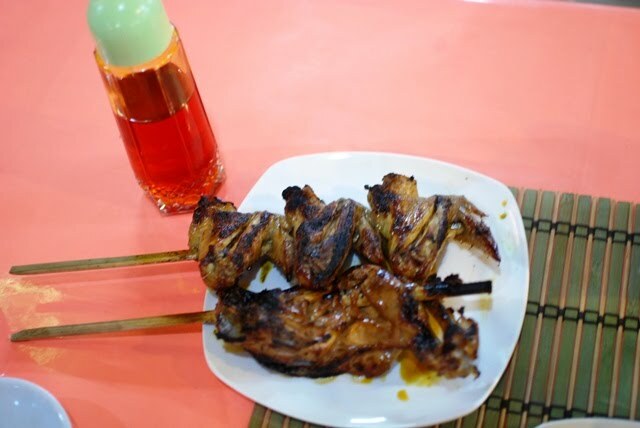 To sample the chicken inasal, which is actually a local version of grilled chicken, I ordered paa (thigh part) for PHP50, and pakpak (wings) for PHP40. Served with annato/achuete oil that you can pour in the chicken or over the rice, it was a very sumptuous and filling meal. 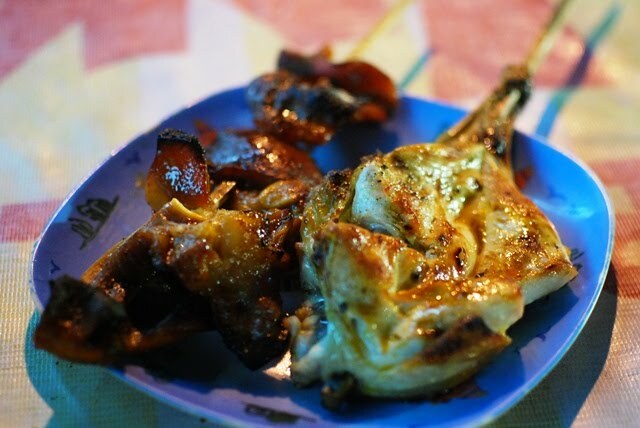 I've always had chicken inasal back in Manila but nothing beats the taste of where it came from, here in Bacolod! 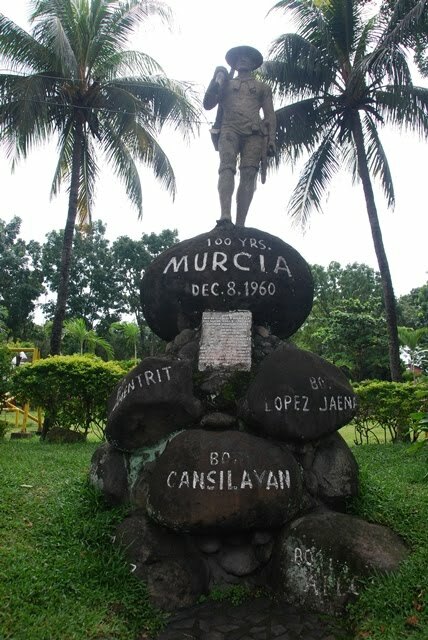 The next morning, I boarded a jeepney bound to the town of Murcia (PHP14) and got down at the town proper. 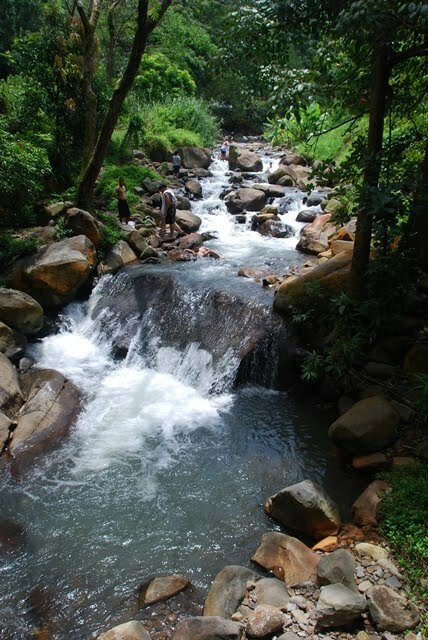 My destination - the springs in Mambukal Resort. From Murcia town proper I rode a mini-bus (PHP15) that took me to the resort. 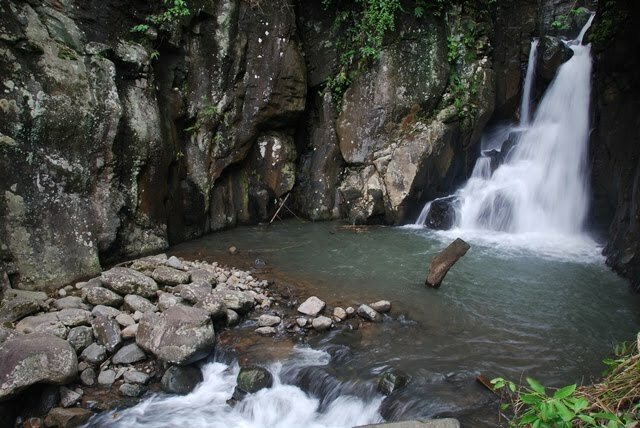 For a PHP30 entrance fee, you can access the springs, go trekking, see the waterfalls or just stay put and have a picnic with your family at the huge grounds of the resort covering a bit more than 23 hectares. 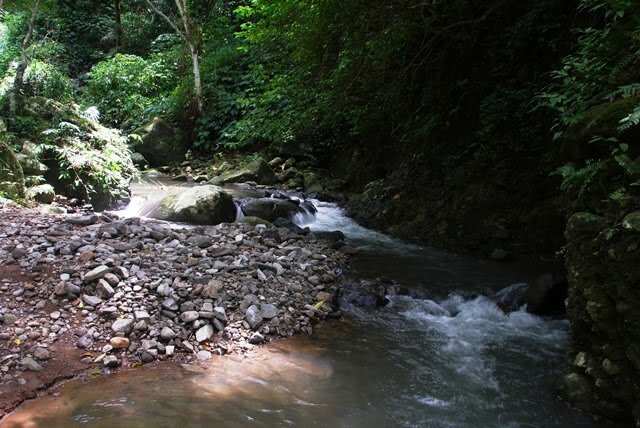 I went into one of the streams and decided to take a short dip. 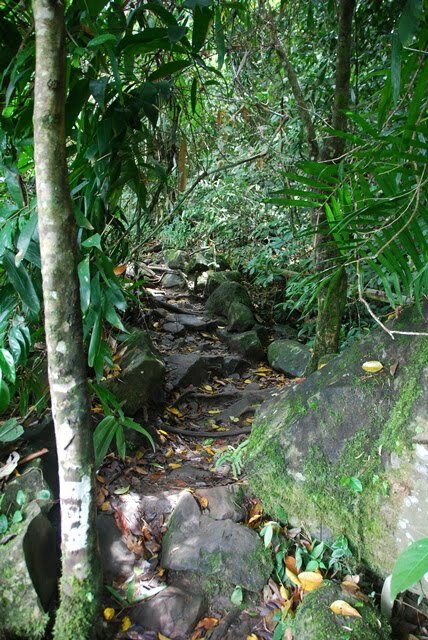 After the dip, I decided to follow the trail leading to the waterfalls. I was told that there were 7 waterfalls if you follow the path. 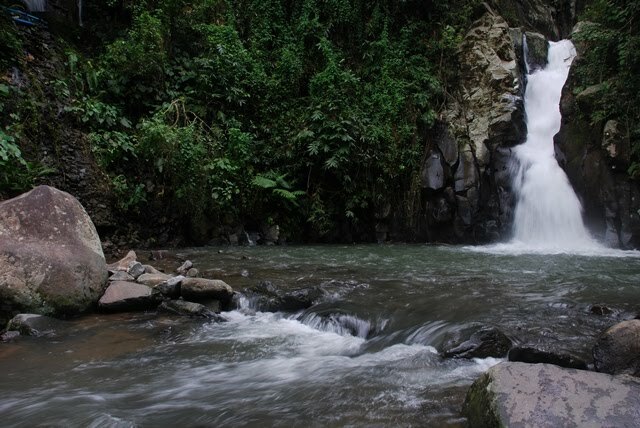 .. and then I reached the first waterfall after around 15 minutes of easy walking. 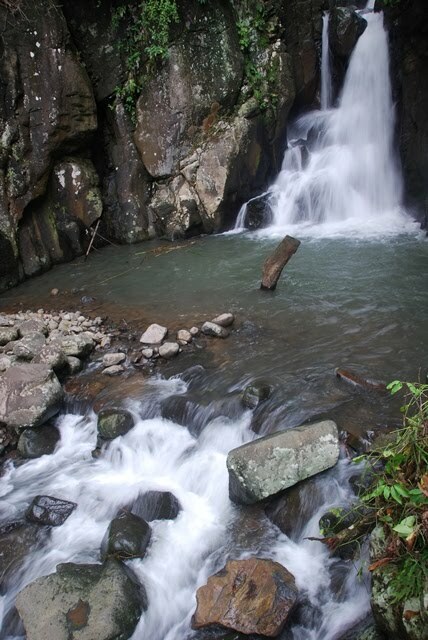 To see the other waterfalls, you have to walk further, going up the mountain. 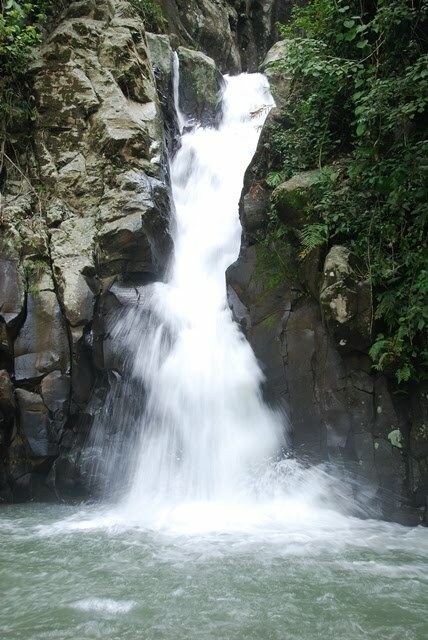 After around 10 minutes more walk, I reached the second watefalls. Fantastic view! I grew tired already and went for a short rest. 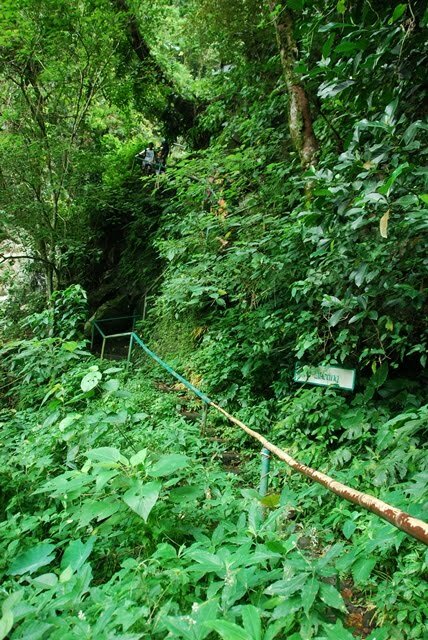 By the way, on the way up, there are some paths that requires you to cross the water, so be ready and bring sandals or something that can be wet at least. 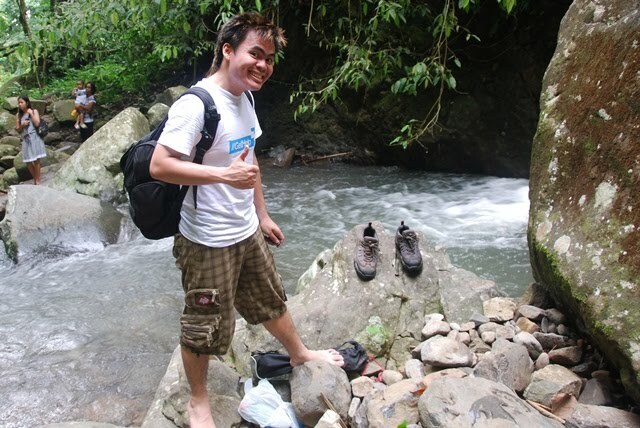 I was wearing rubber shoes (bad idea) so I had to carry it around. Walking at these rocks barefooted isn't funny as well. 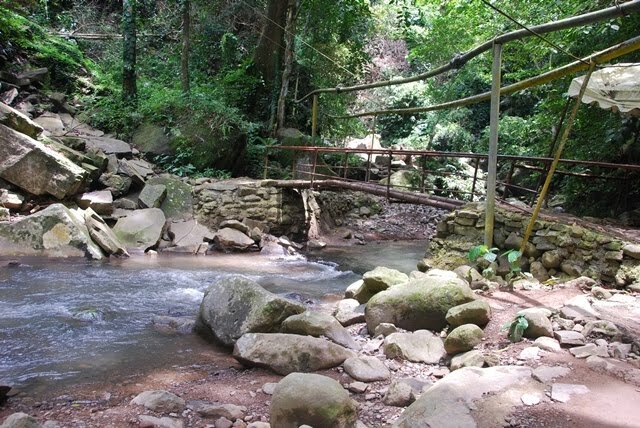 There were other facilities which I did not visit anymore, such as the swimming pool, sulfur springs and picnic areas. 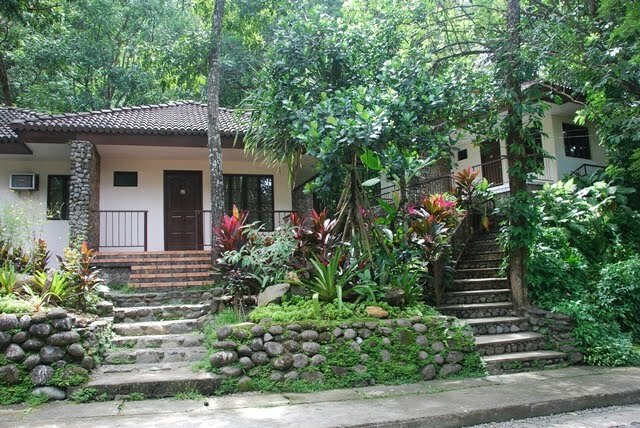 There were also rooms available for rental so a family or group of friends can stay longer, probably a night or so to enjoy the resort. Boarding a mini-bus just outside the resort, I headed back once more to Bacolod City. As soon as I arrived at the city, I hailed a jeepney (with signboard Bata) and followed the direction I learned from another person to get down at Bangga Rose Lawn (PHP7). From there I took a tricycle to and from The Ruins (PHP15 each way). 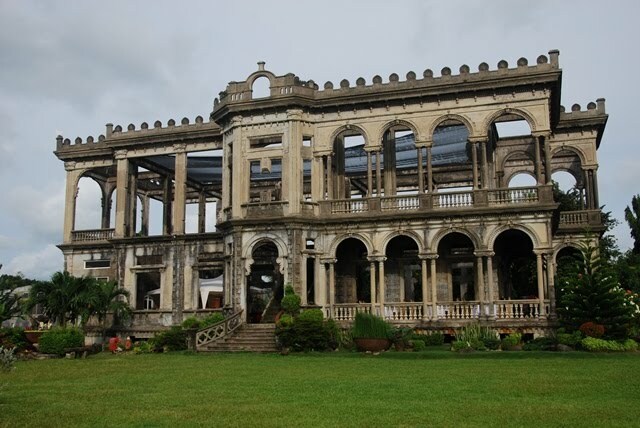 The Ruins, or the ancestral house of Don Mariano Ledesma Lacson located in Talisay City, is famous for its structure of concrete still standing but barely empty space inside. 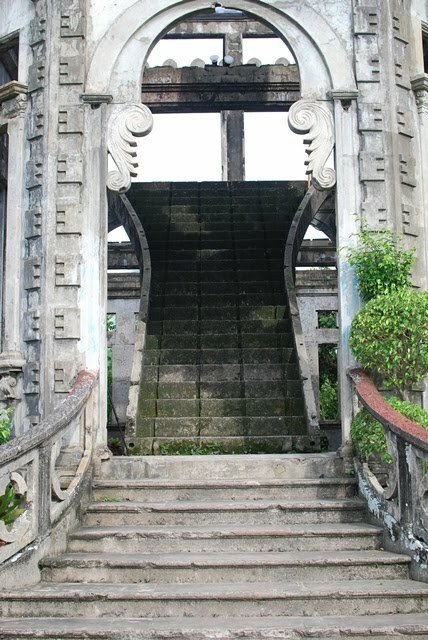 Entrance to the ruins is PHP40. 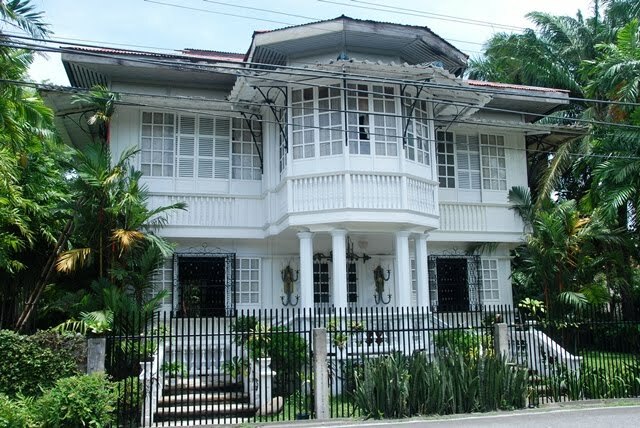 Built in 1900's, I was told that the house was set into fire to prevent Japanese soldiers from using at as headquarters during World War II. 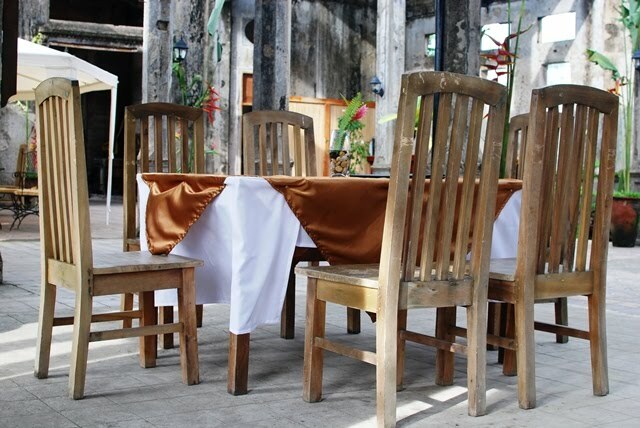 Today, they converted the inside to a restaurant serving mediterranean cuisine. The second floor is off-limits since it was unsafe. 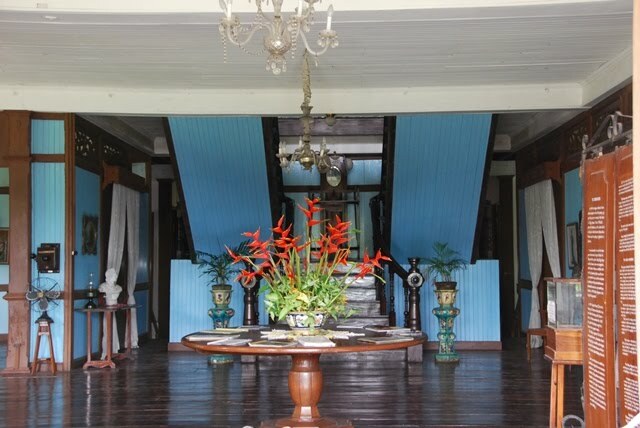 The staircase leading to the upper floor is still standing but there is no floor to stand when you reach upstairs, other than panels and beams. 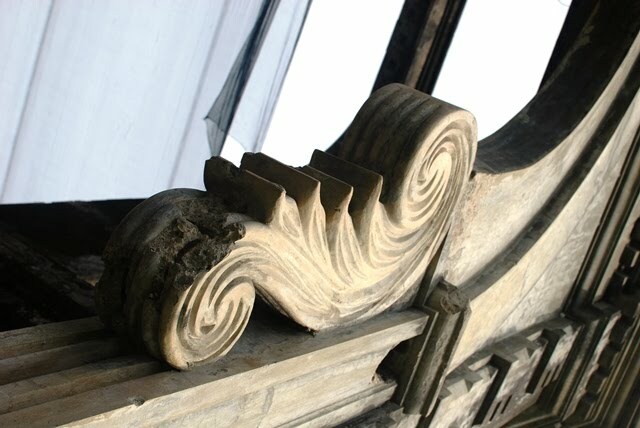 The details of this Italian inspired, neo-Romanesque was superb, and yes, it has withstand all these years. Queer but a magnificent sight, it has left me wondering why these skeletal structure of once the biggest mansion still stands today. 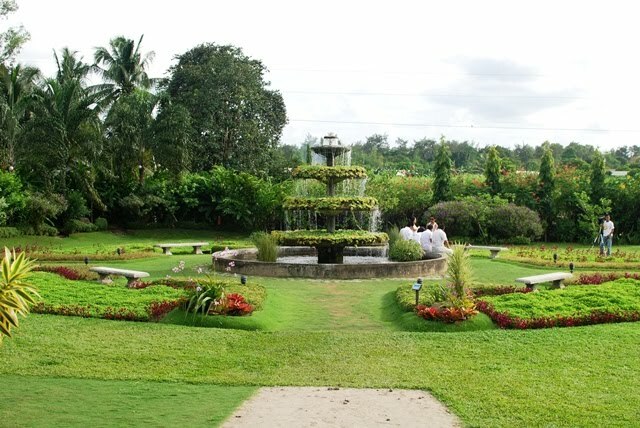 The grounds were also vast, where a garden and fountain can be found. A group was doing a video shoot when I was there. 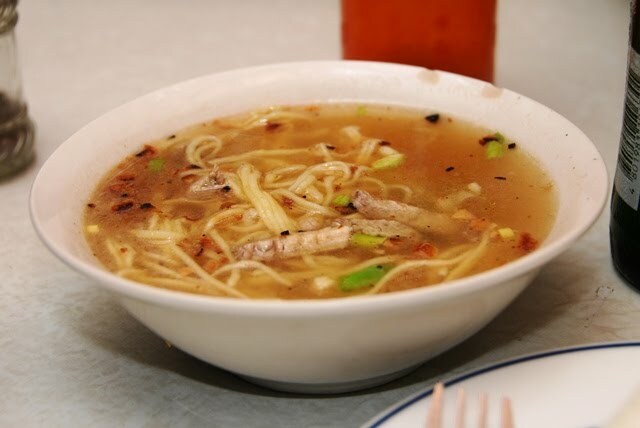 When I went back to Bacolod City, I was already hungry so I ate at Super Batchoy House II, located just in front of my hotel. I tried what seems to be the best and their specialy in their menu, the Super Batchoy - Super Special (PHP65), served with chicharon, utok (bone marrow) and egg. 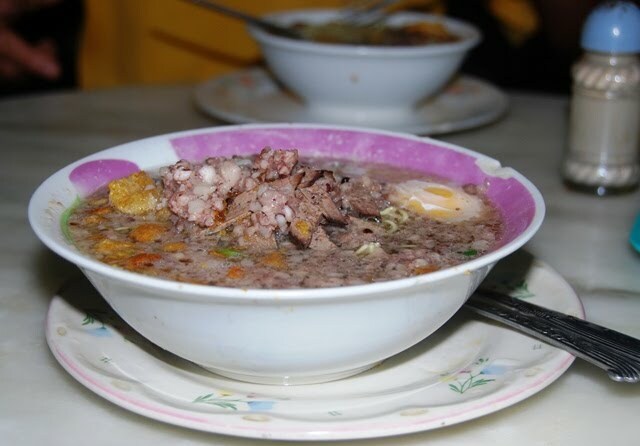 It was very delicious and I never had a Batchoy as good (and bad for health) as that before! 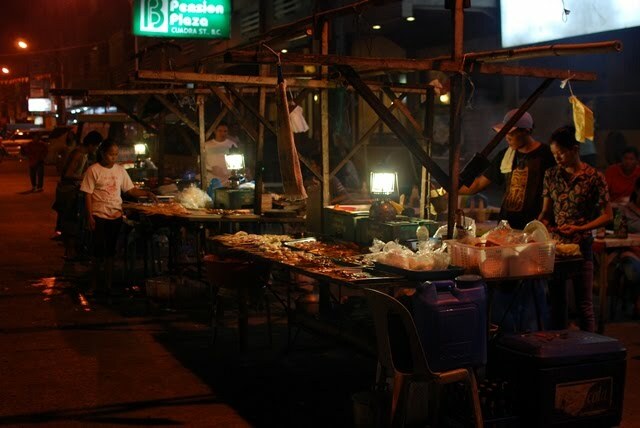 For dinner that night, I decided to eat out just outside the outside Bacolod Pension Plaza and try the food they were serving at the hawker street stall. While I was waiting for my food to be cooked I helped myself in the condiments and squezed calamansi (Philippine lemon), put siling labuyo (small chili peppers) and mixed them into soy sauce. This will be my dip for dinner that night. I had tenga (pork ears) for PHP37 and pecho (chicken breast) for PHP37). Rice was served wrapped in coconut leaves for PHP7. Dinner was good, especially the pork but I like the chicken I ate the night before more than this. 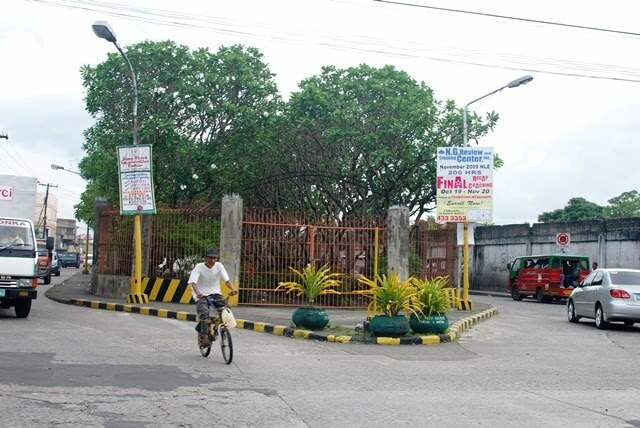 On my third and last day in the city, while I was on my way to the bus terminal, I happened to pass by Familia Luzuriaga Cemetery, a privately-owned land used as a cemetery but known to hold a Guinness World Record as the only one in the world situated at the intersection of two highways. Yes! This is a cemetery right in the middle of a street! 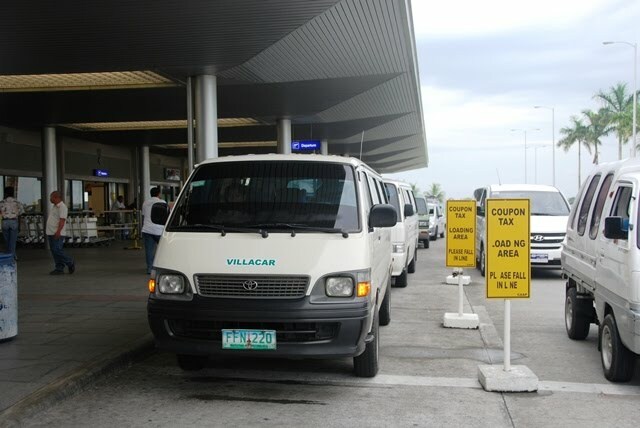 When I arrived at the Libertad SDL Terminal, I rode a mini-bus to go to La Carlota City(PHP30). 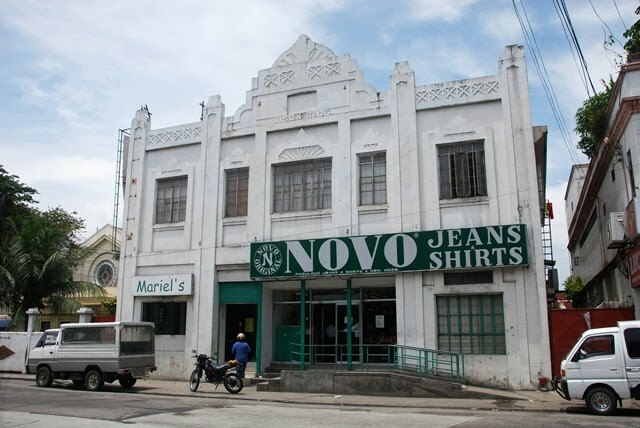 An hour and a half away via mini-bus, the city is known to be home to the oldest and prominent sugar mills. 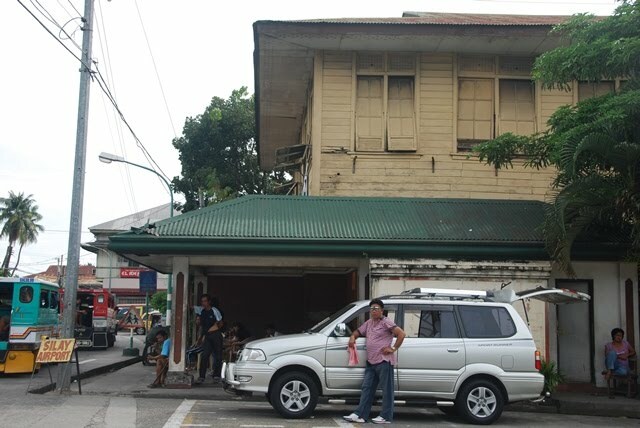 Form the city hall, I hailed a tricycle to take me to the place passed by the mini-bus (PHP6). 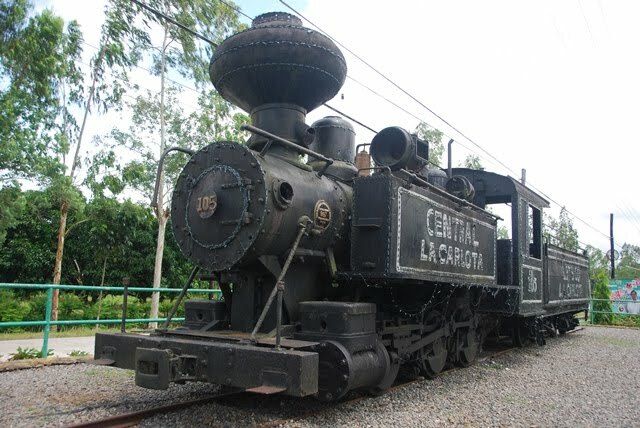 This is the welcome marker of the city where a steam locomotive train, once used to carry the sugar canes, is on display. 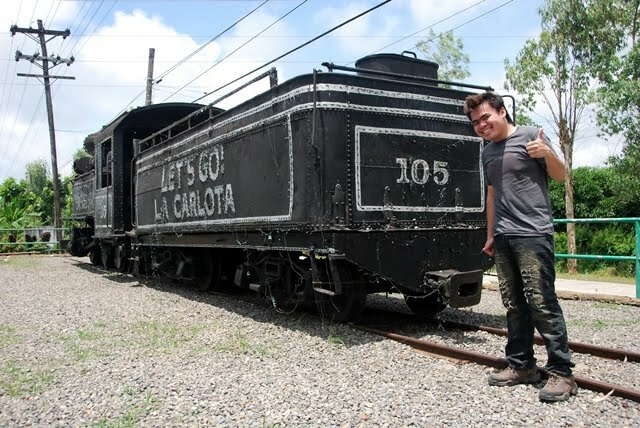 The city is known to have a number of these but during the past years, they started to remove the tracks and train use is almost becoming extinct. Soon thereafter, I realize time is almost running out and there's nothing much for me to do here so I went back to Bacolod and catch my ride going to the airport. 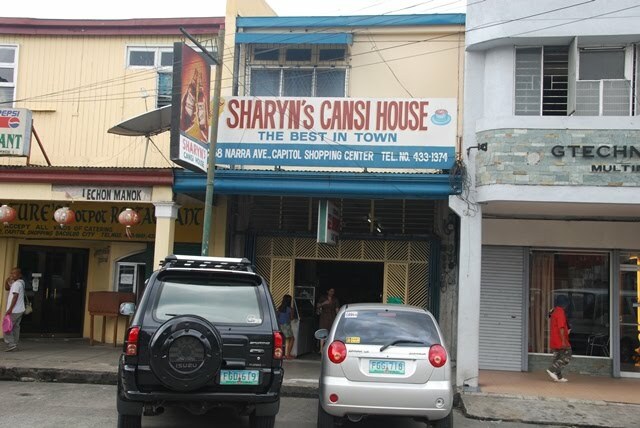 But before that, since it was past lunch time, I passed by Sharyn's Cansi House near an area they call as "Shopping Center". 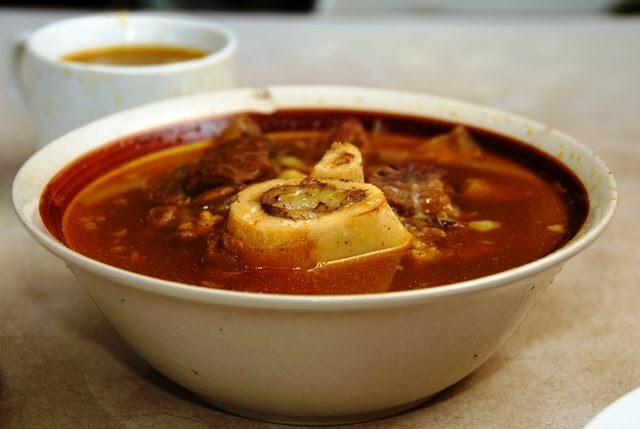 Of course, what I ordered was Cansi (PHP180), said to be a Bacolod version of bulalo (a Batangas delicacy), where a beef bone boiled in soup, oozing with bone marrow. 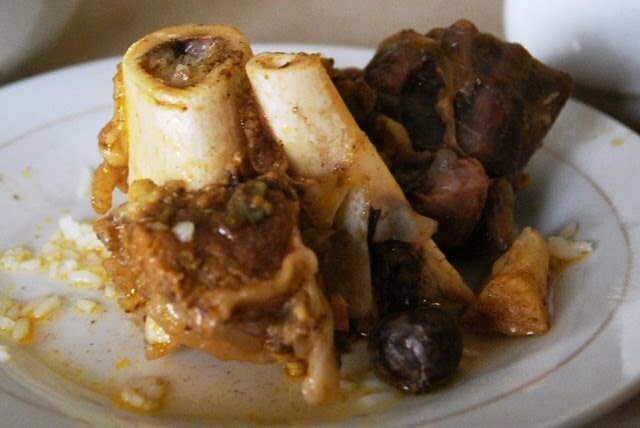 Yes, bone marrow makes it good and delicious, but take note this is a very sinful dish, high in cholesterol and fat and can shoot up your blood pressure! Still, this didn't stop me! The meat was soft and tender, and the taste was very good. I finished a whole bowl supposedly good for 2 persons! Unlike bulalo, the soup was a bit sour, similar to sinigang (tamarind-based soup) which is actually good since bulalo is more like just a boiled version of this beef part. After dinner, I rode a jeepney to Silay (PHP13) and wandered for a few minutes before catching the airport shuttle (PHP50). 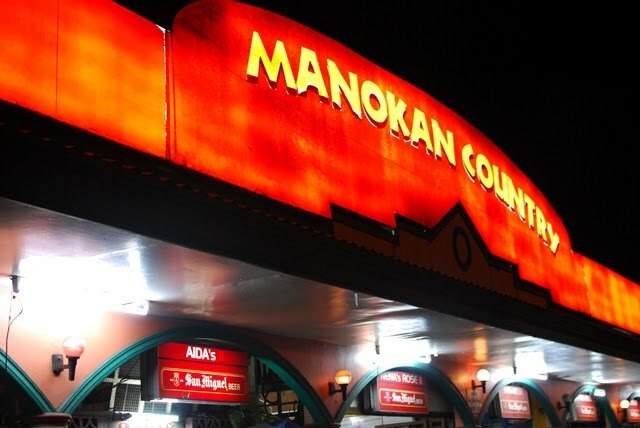 This was a quick weekend trip for me, unplanned and turned out to be an adventurous delight to both sights and tastes. 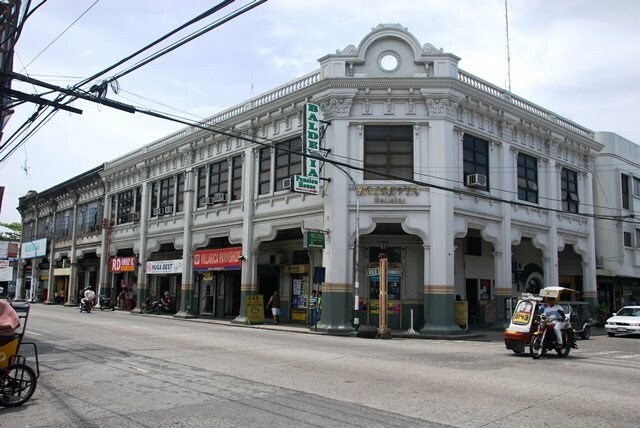 It was unfortunate that because of the lack of planning, I didn't know until I reached the city that Masskara Festival, or a parade of partipants wearing masks, is supposed to happen just a few weeks after. Maybe next time! 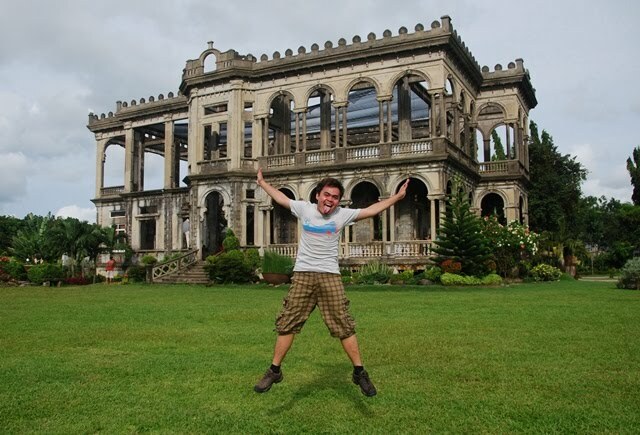 wow, you've been to Bacolod,I want to visit The Ruins since when I saw sunset pictures of the place... it was majestic and beautiful at sunset. Is there much to do there aside from viewing, eating and photo souvenirs? Yes. I heard that there's a cafe inside... is it pricey to eat there or it is just really recommended to do sightseeing there. thanks for sharing this. 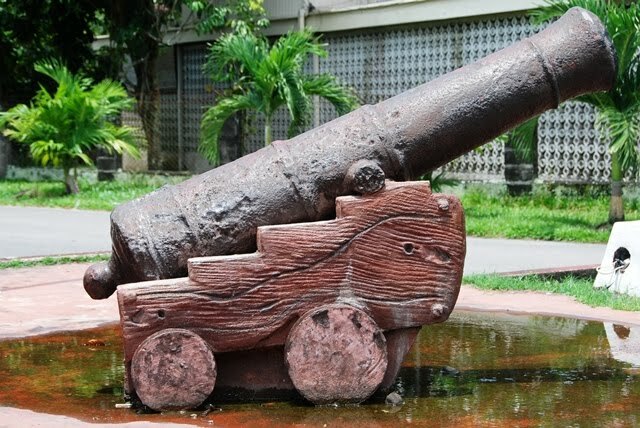 it will be very helpful for me on my trip to bacolod next week. thanks a lot.